Icosahedron is variation of the game Scattergories by Hasbro. It is a fast-paced heads-up style game where winning involves wit, luck, and knowing your audience. The game is called Icosahedron because of the twenty-sided dice which is used to play it. The idea for the game originated when my friends and I were bored on a Friday night and were looking for a new game to play without going out to buy one. Icosahedron has since become our preferred game because it is quick, easy-to-play, and suitable for a wide variety of players. A Scattegories dice (the Icosahedron). The game consists of two active players, who are in a one on one competition, and everyone else, who act as moderators of the competition. The active players alternate rolling dice with the current champion rolling first. If there is no current champion, everyone should argue about who goes first. When a moderator thinks of a category, they will announce that they have a category. This indicates that dice rolling can commence. As the dice is rolled, the moderator will call out their category. The first active player to successfully call out an answer that begins with the letter facing up on the dice earns one point. 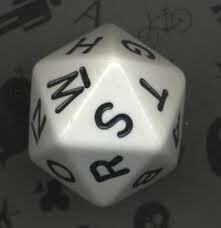 If an answer uses two consecutive words that begin with the letter which appears face up on the dice, it is a “double” and is worth two points. If both players answer simultaneously, neither player gets a point. A new category is decided and the next player rolls the dice. The success of an answer is subject to a vote by the moderators. If the majority agree with the answer, it is deemed correct. Thus it is important to know your audience. If an answer is technically correct but obscure, it will be voted down. It is also possible for an answer to be incorrect but be voted up. If the moderators are split on whether an answer is correct, the answer is correct. This is why the game is best played with an odd number of players (so ties don’t happen). The first active player to earn two points wins the round and is the new current champion. The game restarts and the person to the left of the loser plays against the current champion. At any time after the dice has been rolled, one of the moderators (or active players if they cannot answer) can start counting down from five seconds. After five seconds without a successful answer, a new category is decided and the next player rolls the dice. Arguing is a cardinal aspect of the game. Healthy debate is strongly encouraged. If you feel that an injustice has occurred, it is your duty and obligation to argue your point vigorously. Remember, the game cannot continue until arguing stops so feel free to filibuster the game. Icosahedron is a microcosm of the U.S. congress. When an active player scores a point, the loser drinks. If an active player scores a double, the loser drinks twice. If a moderator calls out a category that neither player can answer, they have five seconds to answer their own category. If they cannot, they drink. If the current champion makes it back to playing against the same person that they beat to become champion, they go “around the world” and everyone drinks a social. – What letter am I thinking of? My name is Daniel Bank. I am a software engineer with a background in physics. My primary interests are mobile and web development, as well as automation. My hobbies include traveling, scuba diving, playing music, writing, learning about mythology and history, and playing games.